The longest sport SXS ever?! The Can-Am Maverick X3 MAX! Somewhat expectedly, BRP just announced a date for their release of the Maverick X3 MAX! This MAX suffix has been a staple of their 4 seater line for ages so the naming convention makes perfect sense. What may be more interesting though is how they plan to package this machine efficiently. The 4 seaters of yesteryear have simply been stretched versions of their 2-seater counterparts, but with the X3 already having the longest wheelbase of any 2 seater by 7 inches (Wildcat X 95″, Maverick X3 102″) it may not be a bad idea to design this machine in such a way that it doesn’t look like a school bus. Could their new laid back seating position help with packaging? Math used from the previous generation Maverick XDS compared to the Maverick XDS MAX tells us to expect somewhere near an additional 30″ of wheelbase (to stretch the X3 MAX to a monsterous 132″!) which trounces the absurdly long Wildcat 1000-4 by almost a foot. Regardless of length, the MAX XRS may quite possibly be the biggest and best 4 seater to be introduced since the release of the XP1000-4. With the added width, giant 30″ tires, and insane suspension, the added wheelbase could come as a source of ride improvement as many have seen with other 4 seat models. That of course is all assuming that Can-Am releases the 4 seaters in all of the flavors that the 2 seater has. So we will all be patiently waiting until the proposed Feb 15th 2017 date for the launch of the 4 seater. Until then, be sure to check us out on YouTube, Facebook, and Instagram! 2 Comments on "The longest sport SXS ever?! 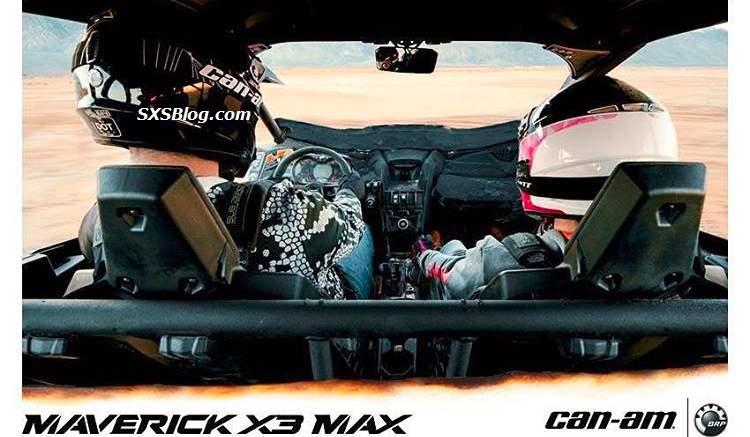 The Can-Am Maverick X3 MAX!" If they just get rid of the rear cargo area they could save some length there, otherwise it will just be too long. That Wildcat 4 looks ridiculous. 30 inch tires aren’t all that giant when you have a 135″ wheelbase. My regular cab K2500 has a shorter wheelbase and came with 31’s lol.